Is the Pentax K5 simply a modest upgrade to an already existing camera, or one that deserves recognition in its own right? The K-5 was announced at a time when a number of other manufacturers were updating their own lines with likely competitors, notably the Olympus E-5, Canon EOS 60D and Nikon D7000. It improves upon the Pentax K-7 with a new sensor and focusing system as well as a multitude of smaller customisations and refinements. When you look at the Pentax K-5 vs Nikon D7000, Pentax K-5 vs Canon EOS 60D and Pentax K-5 vs Olympus E5, all three offer something different, but the Pentax K-5 can comfortably list a number of features which arguably make it the most intriguing of the group. The Pentax K-5 improves upon the K-7's burst speed, increasing the latter camera's 5.2fps rate to 7fps. Although there was some concern upon the K-5's announcement that the raw burst depth was limited to a disappointing eight frames at this pace, this was addressed by a firmware update which boosts the figure to 20 frames at the maximum speed. 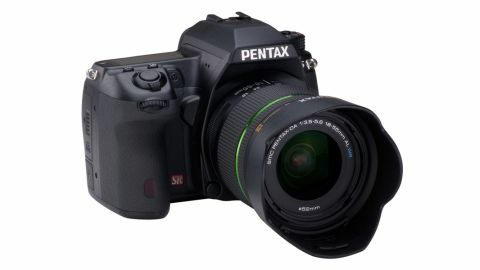 While the K-7 had slightly unusual and non-standard video specifications, the Pentax K-5 allows Full HD 1920x1080 pixel recording at 25fps, and the other more standard 720p and VGA options. Audio recording is limited to mono via the on-board microphone, although a socket has been provided around the camera's side for external stereo recording. Where there's movie recording there's also live view, which allows for autofocus in three ways, either through face-detection or the more standard phase- and contrast-detect options. Using the contrast detection AF system during live view, and for focus prior to movie recording, the camera immediately zooms into the centre of the frame whenever the shutter release button is half-depressed, before quickly focusing and zooming back out again. While the speed at which this happens increases the live view system's usability in different situations, occasional mis-focuses and problems with finding focus mean it can't always be relied upon when lighting conditions aren't optimum. Nevertheless, in good light the system is accurate, speedy and more than convenient, and provides a preferable alternative to manually adjusting yourself (which, of course, is still possible). The vibrant green light which illuminates the top-plate LCD makes all exposure information contained within it easy to read, while the equally powerful AF assist light springs readily into action wherever the camera senses it could help achieve focus. The new SAFOX IX+ autofocus system inherits the eleven points of previous SAFOX modules, but these are spread over a wider area, and the most central nine are cross-type which makes them sensitive to both vertical and horizontal details. In comparison with SDM-equipped optics such as the DA* 16-50mm f/2.8, the 18-55mm kit lens with which the Pentax K-5 is available delivers a reasonable performance overall, focusing only marginally slower in good light and takes just a little more time to confirm focus, once it has reached a rough approximation. As may be expected, this is done with considerably more noise from the lens's motor, and there's decidedly less fluidity in its movement, too. The K-5 is one of a recent number of cameras to incorporate an electronic level for keeping horizons straight, but it also retains another one of the K-7's more interesting features, whereby the position of the sensor may be shifted to help with composition. The sensor may be moved up, down, left or right up, and even rotated slightly to fit with a straight line - such as a horizon - within a scene. For most situations the electronic level function should provide sufficient guidance here, although the Composition Adjustment feature is the preferable choice when using the camera in conjunction with a tripod, where particularly fine adjustments may be awkward to perform using a tripod head. For even speedier access it is also possible to assign the Composition Adjustment function to the Raw/Fx button. This feature is an extra benefit of the K-5's sensor-shifting Shake Reduction (SR) system which automatically moves the sensor to compensate for accidental camera movement that can blur images. Conveniently, the SR system works with any mountable lens.